"A picture is a flat surface with paint on it - nothing more." Post-painterly abstraction is a broad term that encompasses a variety of styles that evolved in reaction to the painterly, gestural approaches of some Abstract Expressionists. Coined by Clement Greenberg in 1964, it originally served as the title of an exhibition that included a large number of artists who were associated with various tendencies, including color field painting, hard-edge abstraction, and the Washington Color School. Greenberg believed that, during the early 1950s, Abstract Expressionism (or, as he preferred to call it, "Painterly Abstraction") had degenerated into a weak school, and, in the hands of less talented painters, its innovations had become nothing but empty devices. But he also believed that many artists were advancing in some of Abstract Expressionism's more fruitful directions - principally those allied to color field painting - and these were yielding to a range of new tendencies that he described as "post-painterly." Greenberg characterized post-painterly abstraction as linear in design, bright in color, lacking in detail and incident, and open in composition (inclined to lead the eye beyond the limits of the canvas). Most importantly, however, it was anonymous in execution: this reflected the artists' desire to leave behind the grandiose drama and spirituality of Abstract Expressionism. Some critics, including Clement Greenberg and Barbara Rose, remarked on the decorative character of some post-painterly abstraction. In the past, Harold Rosenberg had described failed Abstract Expressionist paintings as "apocalyptic wallpaper," suggesting that decorative qualities were to be avoided. The new tendency suggested a change in attitudes. In 1964, critic Clement Greenberg was recruited by the Los Angeles County Museum of Art (LACMA) to curate an exhibition devoted to young abstractionists. He was a natural choice to curate such a show, as by the late 1950s he had a prominent reputation as a defender of contemporary abstract art. Greenberg called the exhibition Post-Painterly Abstraction, although in the essay he wrote for the exhibition catalog he never actually referred to the style by name. Instead, he defined it by what it was not - "painterly abstraction," or the style of the Abstract Expressionists. The work of Sam Francis contains many visual indicators reminiscent of the "action painting" or art informel schools of Abstract Expressionism. What made Francis a unique painter was his technique of tachisme, in which heavy blotches of free-flowing oil paints were allowed to drip down and, in the process, create an accidental design. In Blue Balls VII, which was included in the 1964 Post-Painterly Abstraction exhibit, Francis used far less paint than he was accustomed to. The end result showcases razor-thin lines of blue paint that cascade down from the more prominent blotches applied throughout the canvas. California native John Ferren (who was actually older than most of the first-generation AbEx artists) retained elements of what Greenberg called the "Tenth-Street touch." He described this as when "The stroke left by a loaded brush or knife frays out, when the stroke is long enough, into streaks, ripples, and specks of paint. These create variations of light and dark by means of which juxtaposed strokes can be graded into one another without abrupt contrasts." Greenberg criticized the "touch" as a safety net of sorts for those artists having trouble creating a unified image on an abstract plane. However, he praised Ferren's Dance and other similar works for applying the "Tenth-Street touch" and at the same time "boxing it within a large framing area" and managing "to get a new expressiveness from it." Kelly's Red Blue recalls in many ways Barnett Newman's signature "zip" paintings, with the single dividing line cutting through an otherwise unified field of color. What set Kelly's painting apart was the way in which he applied the pigment. Kelly allowed his diluted oil paints to soak into the canvas, rendering the surface a clean and utterly flat picture plane. His red divider is also much wider than Newman's "zips," and applied to create a cleaner, simpler hard-edged line. 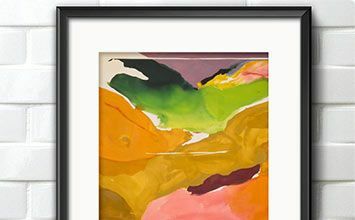 Another key characteristic of Kelly's hard-edge, Color Field paintings was his tendency to only use two opposing colors. In Greenberg's essay for the Post-Painterly Abstraction catalog, he was careful to point out that the post-painterly artists were in fact rejecting the technique of action painting, but this rejection in no way constituted an attempt to return to neo-plasticism or synthetic Cubism. This assertion is difficult to believe upon looking at Mehring's The Key (which was part of the Post-Painterly exhibit), which visibly recalls Mondrian's geometric abstractions, at least in form if not in color. However, what set Mehring's painting apart was his use of perfect symmetry, both in depicted and literal shape (painterly form and canvas measurement, respectively), for which Mondrian was not known. In fact, all three of Mehring's paintings at the 1964 show measured 78"x78". One of Noland's signature series of paintings was the Target paintings, which for him also doubled as his own brand of Color Field Painting and geometric abstraction. In Cycle Noland created something particularly uncomplicated and, in fact, the near opposite of the Color Field style. Cycle's central target is entirely surrounded by bare canvas; a compositional decision also made by fellow painter Morris Louis. What Noland achieved with this painting was most likely what Greenberg had in mind when he wrote about the post-painterly rejection of the "doctrine" of Abstract Expressionism. By creating a strikingly simple geometric form and emphasizing more canvas than paint, Noland was definitely moving beyond the visual confines of freeform abstract painting. Greenberg wrote in the Post-Painterly catalog that many of the artists represented "have a tendency...to stress contrasts of pure hue rather than contrasts of light and dark...In their reaction against the 'handwriting' and the 'gestures' of Painterly Abstraction, these artists also favor a relatively anonymous execution." Olitski's Isis Ardor was one of the paintings included in the 1964 show and was certainly an ideal example of a painting that opposed flat planes of color. The contrasts Greenberg spoke of appear to be more of a visual tension in Olitski's painting. His three colors, interacting with small portions of bare canvas, sit so tenuously in the canvas that it almost appears as if they are struggling to resist one another, and with few exceptions they succeed.